Welcome to our chimney cap page. Most people do not know the difference between a chase cover, and a chimney cap. This page is to help you understand whether you need a chase cover or a chimney cap, determine what type of chimney cap you need, as well as display our available decorative chimney chase covers. Chimney caps are smaller round or square caps that are designed to cover the flue only. They are made to allow smoke or gas fumes out, but also keep rain from going down the flue of your chimney. Chase covers on the other hand are large metal covers that are made to completely cover the top of your chimney. They are designed to stop rain from going inside your chimney. Chimney caps are either made to fit specific fireplace flue sizes, or specific models of factory built fireplaces. 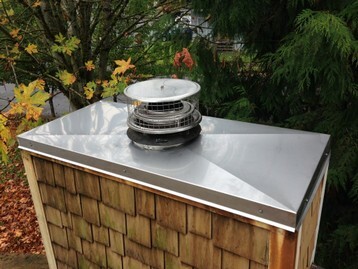 Chase covers are made from galvanized metal and are custom made to fit on the top of your chimney. A damaged or missing chimney cap or chase top could cause some serious problems so it is best to resolve the issue immediately. We also offer Decorative tops that can offer some extra protection but generally are to change the appearance of the top of your chimney. 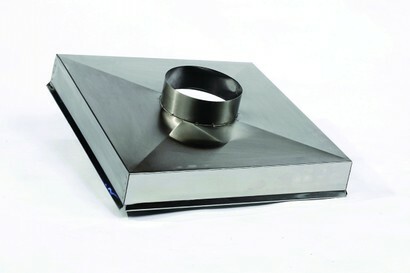 Decorative tops can be made in standard galvanized or a paintable galvanized. This is a masonry chimney cap. 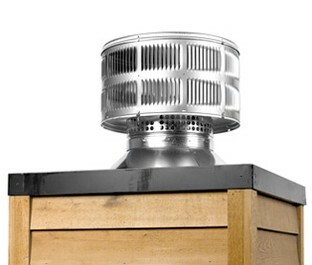 These style chimney caps come in different sizes to match the corresponding size chimney flue. 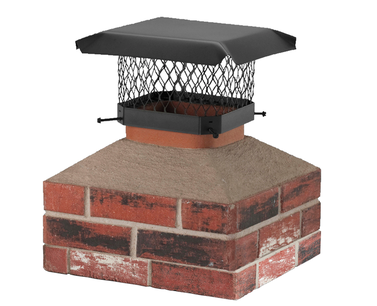 This style chimney cap only works with masonry fireplaces. This is a pre-fab chimney cap. These round style chimney caps are used with a factory built fireplaces. These caps are made by the fireplace manufacturer, and are only made to fit specific make & models of fireplaces. Chase Covers: All chase covers are custom made to fit the top of your chimney. Chimney chase covers will typically require a service call to your home for us to take measurements, and will require payment in full before fabrication can begin because they are custom made. If you plan on installing your chase cover yourself & just want us to build the chase cover for you according to your dimensions we can do that as well. However, if we make a chimney chase cover to your dimensions, and it does not fit your are stuck with it. If we come take measurements, we are responsible for it fitting. Decorative chimney tops are custom made for the top of your chimney. Although some of them can add a layer of extra protection, these chimney tops are primarily made for decorative purposes only. All decorative chimney tops a completely custom made to our measurements so they will require a service call to your home in order for us to take the measurements required for fabrication. Payment is required in full before fabrication on all custom made chimney caps can begin. Fabrication typically take 7-10 days, and once complete we return a second time for installation. Prices vary according to size, and the difficulty of the installation. Decorative chimney tops have several color options. You can choose to have your chimney top made in galvanized metal, have your own painter paint your chimney top & let us install it, or we can have it fabricated in one of the colors from our color chart below.